The best advice I ever got for preparing for baby #2 from moms that have been there and lived to tell about it. For more thoughts on motherhood, click here. Anticipating Kaitlyn’s arrival, despite only being 2 years ago, seems like such a distant memory. However, some of the sentiments I felt leading up to her May debut are easy to recall. I remember feeling a little sad that I was revoking Hailey’s only child status. Would she resent me? Then there was the worry no mother likes to admit to- will I be able to love this next child as deeply and completely as my first? Instead, I want to pass on the real advice for preparing for baby #2, the nitty gritty given to me from friends (both online and IRL alike) that had been through it and decided they liked me enough to pass on the tips for surviving those early days while adjusting to having more than one child in my solo care. So while I’d like to take full credit for the following, it’s actually way more valuable than my words alone because it’s been tested and proven by multiple moms over several years— so please pin it for later or share it with those that may need it, as these tips really helped me! 1. The baby doesn’t know what you are saying- use this to make the older child feel important. Huh? Let me explain. A newborn demands a lot of attention. Suddenly your older child will seem and look like an adult (when did they get so big?!) and it’s easy to prioritize the baby’s needs because they are so immediate and come so often. Kids are so perceptive though and too many times of choosing the baby’s need to eat, be bounced, etc over admiring the older child’s seemingly less important scribbling can lead quickly to negative feelings. I know to anyone that could have been listening I must have sounded like a crazy person, but verbally expressing that Hailey came first sometimes or at least making her feel included helped keep us from battling any feelings of jealousy. Kaitlyn obviously never knew or cared what I was saying anyway! 2. Enlist the older child’s help with specific requests. I’m not sure if it’s because my older child was a girl, but Hailey was eager to help with the new baby. However, newborns are so fragile and my mommy instinct wanted to constantly squeal “be careful! don’t touch!” To redirect her loving intentions, I’d ask for help in more specific ways then over exaggerated my gratitude. I’d ask Hailey to grab a diaper for me and she’d run off. When she returned, I’d factor in a little bit of tip #1 and say “Oh wow, Kaitlyn, did you see how fast Hailey was in getting your diaper? 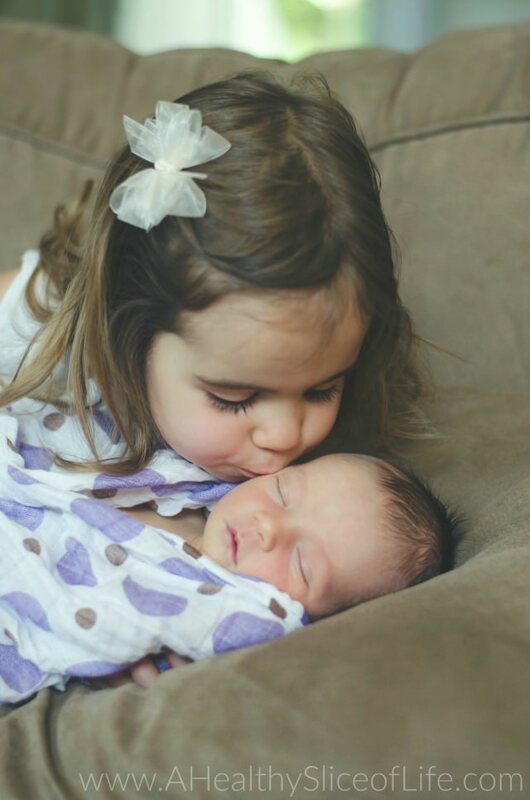 What a great big sister!” I’d tell Hailey how grateful I was for her help taking care of “our” new baby and would actually refer to Kaitlyn as “our (family’s) baby” because I found it helped Hailey feel more included and take ownership in helping with her care. 3. Invest in some good solo toys. And if you are visiting a friend that just had a baby and want to bring a gift, it’s much more helpful to bring a project for the older sibling rather than a gift for the baby. Good options will definitely vary by age, but at the time Hailey was 2 1/2 and a couple life savers for us were: this bear dress-up puzzle (still a household favorite), any of these deluxe sticker books, reusable sticker books and magnatiles, which yes I know are pricey but worth every cent as we still use them daily and their possibilities are endless. Whatever you choose, make sure it is something that the child can do 100% on their own. 4. Remember that for the first few weeks/months is survival time. Whatever you do during this period of time is OK. Really. I worried that whatever I did those first few weeks would become Hailey’s new normal. I was wrong. Snacking all day instead of making her meals? Letting her eat on the couch? Letting her wear her pajamas for a quick Target run? All a-ok; it’s all about survival. A friend of mine brought over a couple new kid movies even though I insisted I wouldn’t need them. Well I remember the day that I popped two of those suckers in the DVD player back to back then cried to my friend that I’d failed as a mom (postpartum-hormone-induced-drama perhaps?). She assured me she had felt the same way. So let me pass along this grace to you that if your child watches 3 movies in a row on rough day, you did not ruin them. Drop the guilt; you’re doing a great job. 5. Laugh. Even if it’s through your exhausted tears. My first week alone with the girls was filled with ups and downs. Nothing humbles you like trying to wipe a toddler’s bottom while simultaneously nursing a newborn and looking up to see your own disheveled reflection in the mirror. It’s not glamorous, and some days are downright hard, but I look back fondly now on those crazy memories that bonded us as a family of four. Miscellaneous. Of course there are some great common sense tips too when preparing for baby #2, like always say yes if someone asks if they can help. Some great assistance can come in the form of them taking your older child to the park, pool or anywhere to ease your guilt of having them housebound. I can also be nice, once you’re ready, to have someone come watch the baby so you can have some one on one time with your older child. Keep lots of easy to grab snacks around (like these or these) for both you and your older child instead of just freezer meals. And take a lot of pictures because during the crazy whirlwind– they grow so fast! Expectant moms of two- what are you most worried about or excited for? Veteran moms- please weigh in! What are your best tips for handling the early days of more than one child? Such beautiful tender pics. Good to see innocence during these turbulent times. All those tips are wonderful! My daughter was only 16 months old when we welcomed our second child. I thought it might be an easy transition because she wouldn’t really know what was happening. WRONG. She figured it out the second I walked in the door with the new baby. I didn’t handle it well…ie overcompensated by showering attention on my eldest, allowing my guilt to get the best of me, indulging her, etc. Two years later, the relationship between my girls is still tricky. Some of it is classic sibling stuff, but I feel that some of it is also a result of that first formative year. So, don’t do what I did! Obviously make sure you’re child feels loved and secure, but teach them that the younger sibling is important too, and that both children are special and loved. Great point Christy! At some point I did have to back off a little and make sure Hailey knew Kaitlyn was a person too with her own feelings and needs, especially once Kaitlyn started refusing to be dressed up like a baby doll- ha! 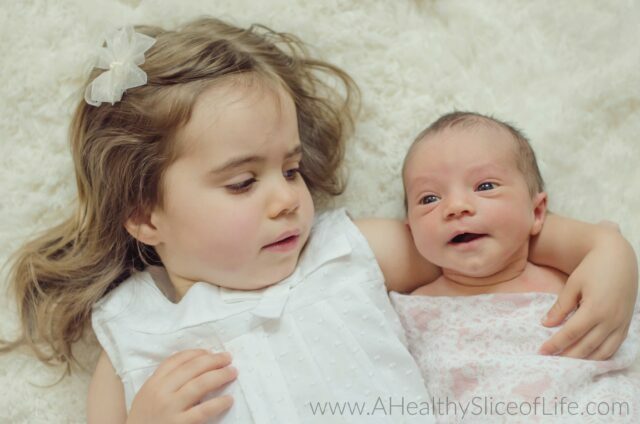 A good friend of mine has two girls really close in age (12 months apart almost to the day) and she says the squabbling can be really challenging some day so you certainly aren’t alone in that challenge. <3 Thanks so much for your input! It’s like you are reading my mind with this! We are expecting baby #2 in about 7 weeks and will have a (currently very demanding – I guess that’s my fault??? 😉 ) little boy at the time. I love the suggestion of talking to the baby about the importance of the older kid – its really amazing how much of what you say toddlers pick up and I think this will work great. And yeah, while we don’t watch a lot of tv, and we try to eat healthy, I need to probably just get over the fact that those days of goldfish snacks and multiple episodes of Daniel tiger will happen, and that it will all be ok. thanks for sharing this and everything else about your sweet family! Street cred fo ‘sho! 😉 Bring on Daniel Tiger! These are wonderful tips. Number 1 – genius!! We are nowhere near to add a second child to the mix, but eventually we want more than one. And those doubts that you were referencing – will I love the second child enough, won’t I feel bad towards my son because he is no longer the center of attention – have crossed my mind. Definitely bookmarking this. Thanks for sharing! This is fantastic. We aren’t expecting a second baby anytime particularly soon, but I am saving this for when we are! This is great advice. As a veteran mom I can honestly say…..it never gets easier the issues just change as they grow. However, that being said, it will be the best, most rewarding thing you will ultimately do in your lifetime. Being a mom is one thing that you will cherish forever no matter how old they are. I always love when you comment, Karen! I feel like you always have love-filled, wise advice to pass on. Just wanted to let you know I admire you and appreciate your input! This was so great to read! I am expecting my second in July and my first will be almost 2. I absolutely wonder constantly how it’s all going to go. I will take this advice to heart for sure. I have a 2.5 year old daughter and am 7 months pregnant with number 2 – so this is perfect timing. Thanks for the tips!! Perfect timing! I’m 29 weeks with #2 and #1 will be 22 months when the baby is born. I’m most worried about keeping Eleanor occupied and safe while nursing #2. I am thankful for daycare, because there is a baby there and Eleanor is used to baby cries/needs/wants, so I hope that helps ease the transition a bit. My youngest turned 6 months old today, and my son was 26 months old when she was born. My husband and I are celebrating today for surviving the past six months, because, truth: it was HARD! I was ready for sleepless nights when she was born, I was not ready for the guilt and hormone roller coaster. The tip about being in survival mode is great, I got way too caught up in trying to accomplish things each day, but some days, we accomplished nothing except feeding and changing diapers. And that is TOTALLY OK. In fact, that’s WINNING! I also wasn’t ready for how much I missed my oldest child, since the newborn was attached to me (literally) all the time. It’s an adjustment, so cut yourself some slack and enjoy the craziness of it all! I LOVE that y’all are celebrating 6 months of survival- congrats on making it! 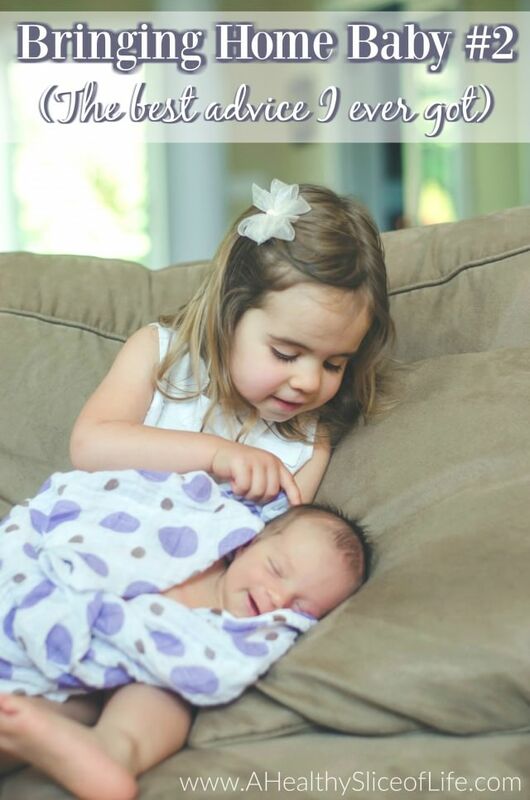 🙂 I’m sure it was incredibly challenging having them close in age like that and I totally agree that days where kids get fed and have diapers changed in somewhat of a timely fashion (wink), it’s a win! Perfect timing with this post as I’m almost in my third trimester with baby #2. I’m most worried about my daughter acting out when her little brother gets here, but as a working mom we have the option to keep her in daycare so I’m hoping keeping that routine will help with the adjustment. She is great at helping me so I’m hoping that I can keep her busy with grabbing things for me or her brother. I really like your idea to talk up the actions big sister takes to help get rid of negative feelings. My friend kept her older daughter in daycare and it worked out really well for everyone involved! Hope it does the same for you 🙂 Congrats!! How is Kaitlyn already so old? Goodness, I remember anxiously reading through every blog post, waiting to see if you were going into labor yet. I cannot believe how quickly time has passed! This post could not have come at a better time! We are expecting our second little girl in early May, and my daughter (4) could not be more excited to have a baby sister and help out with the baby….but truth be told I’m a little nervous that she’ll love on the baby a little too hard, or that I’ll walk into the baby’s room and find that my daughter has over-enthusiastically filled the crib with stuffed animals and covered the baby in blankets. We’re considering putting a baby gate across the door to the baby’s room, more to keep her big sister out than to keep the baby in! I’ll definitely be making use of your first tip – great idea! My daughter is an only child, & she’s 16 now so I don’t need these tips nor do I have any personal experience to pass along, but I couldn’t resist commenting just to say what an EXCELLENT post! Such great tips!!! This could not have come at a better time for me. I just found out I’m pregnant with #2 and for the first few days I was more anxious and worried about how this will affect my son (who will be about the same age as hayley was when kaitlyn came!) than being more excited and joyful 🙁 I’ve started to calm down some and I am of course so happy about the news but I was so thankful that you posted this today. It was just the boost of confidence I need and I’m sure I’ll reference this post in the upcoming months. Thank you!! Great tips! Was wondering about this the other day and I’m sure I won’t forget! And such amazing pictures! Great post!!! I am 13 weeks pregnant with my 2nd (my son is 3.5 years old). My biggest worry is paying enough attention to him once the baby comes. I have already felt a TON of guilt around feeling like I’m neglecting him due to my morning sickness. I just don’t have the energy to play with him the way I used to and it makes me feel awful….so I’m worried that once the baby comes it will start all over again. Everyone keeps telling me that he won’t remember a month or two of not getting as much attention as he’s used to so I’m trying to take this to heart. I will most definitely use some of your tips! All wonderful ideas and most we did when our second son came! I would also add to prep meals the night before, plate out breakfast and lunch, so helpful to not have to think about food. And pre portion snacks to keep where the big kids can take one. I understand how you feel! I remember telling David if I wasn’t pregnant by the time Hailey was 2 that I wasn’t sure I’d ever be ready to go back to an itty bitty baby because it just gets so much easier! I read this when you published it & just came back to read again. I am 37wks with a 3yr old at home. I always love your insight on parenting (you got me through BLW!) and I’m loving the tips on handling two. I’m so nervous about the transition, but this advice will help immensely. (I even sent it to my mom who will be here helping me with the kids.) Thanks, as usual, for giving me the advice I needed! Brittany Dixon recently posted..Is it Worth Selling Clothes with ThredUP?